Once a month, I convince someone close to my heart to guest blog. Because these amazing people are all super interesting, intelligent, and amazing, I’ve given them free rein. I don’t mind whether they blog about something brave, what’s on their mind, or whatever. I can’t wait for you to meet them. 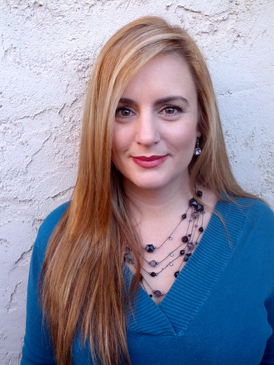 Meet Jessica Wilkerson! I met Jessica in December, right before I started Acts of Bravery. She’s a therapist at Chico Creek Counseling and helps people take brave steps for a living. Needless to say, she instantly loved my year-long brave commitment and invited me to tell my story on her weekly radio show. How could I say no? Jessica is one of those people who, the second you meet her, you love her. Seriously, it’s impossible not to want to be her friend. She’s been one of my number one advocates for bravery and has cheered me on and pushed me to be braver and braver. I love this woman, and after you read her story, I think you’ll see why bravery resonates so strongly with her. “This is going to make such a hilarious story!” At least, that’s what I tell myself when I have the choice to be brave or to bail out. My second-grade teacher called me abnormally shy. She encouraged my mom to put me in a few clubs so I could learn social skills. My mom was astonished. She had me in, Sparkies, Brownies, and I was a Bukeye Cutie. (FYI: the Bukeye Cuties are majorettes in Redding, Ca). There were other reasons for my scholastic shyness, but that’s a different tangent—let’s just say my abnormal level of shyness as a kiddo was due to a lot of internal and external turmoil. In 6th grade, I didn’t have friends. I would walk around the junior high campus pretending I was looking for someone. The only thing worse than being a nerd is being a loner, and it would have been devastating if anyone had figured out I didn’t have a single friend. But by 8th grade I had accumulated a pretty large group of friends. My group was so large, we took over the quad. It was the first time I ever felt like I belonged (thank goodness this was a good group of girls. Who knows where I would have been if they weren’t). Still, I was painfully shy. It was the summer between 8th and 9th grade when I decided I was sick of being too shy to talk to new people. I wanted to be normal, like everyone else. And so, began my journey to BRAVE! I decided to be “Jessica” and to shed Jessie for a new life. I became responsible for myself and my emotional growth (no wonder I grew up to be a psychotherapist!). During that summer I made a point to introduce myself to adults and other teenagers who seemed to be more popular or cooler than I was. I shook their hands and made eye contact—gasp! My heart raced! My head pounded! I wanted to vomit! But vomiting would have been less uncomfortable that remaining the way I was. If I bent over and hurled on their shoes out of anxiety it would still be better than another year of having no friends. This was the summer before high school, people. This was a big deal! High school! I was going to either be the weird shy girl or the girl with all those friends from 8th grade. I had a choice to make and darn it, I finally felt what it was like to have friends and I would stop at nothing to preserve that. Even if it meant daily confronting of my inner horror movie—you know the one being introduced to new people. I’m still that girl inside. I still need my adult self to put a Wonder Woman band-aid on my little girl wound. Often, I walk around Thursday Night Farmers Market with all the people milling around, not knowing anyone, and for a brief moment feel like that 6th grader pretending to look for friends. That little girl is always in there and the grown-up woman in me is always telling her it’ll be okay to step out into bravery. So as adults, how do we reassure the inner critic, the one who is afraid to look foolish or is afraid of taking a chance and getting hurt? And how do we do that? Easy. Through loving self-talk, silly humor, and sometimes a ridiculous theme song to cut the tension. I can believe if I fail I’ll look stupid and people will think I’m weak, dumb, incompetent. I can believe if I tell someone I care about them and they reject me that I’ll be devastated. Jessie is abnormally shy. Even today. Man, labels stick with us, right?! Thirty-one years later and I still hear my mom echo Mrs. Spiegal words. I made new labels for myself: Brave! Strong! Determined! So, do it. Take that chance. Make the first move. Choose your new label! Find your silly song. Find a way to reframe the risk and then own it. Talk down to fear like it’s a bully’s ridiculous story and you’re exposing its nonsense. Shout your new mantra: “Screw you, Fear! I’m getting BRAVE! You ain’t gonna break my stride, you ain’t gonna hold me down!” (Channeling Michael Wilder). 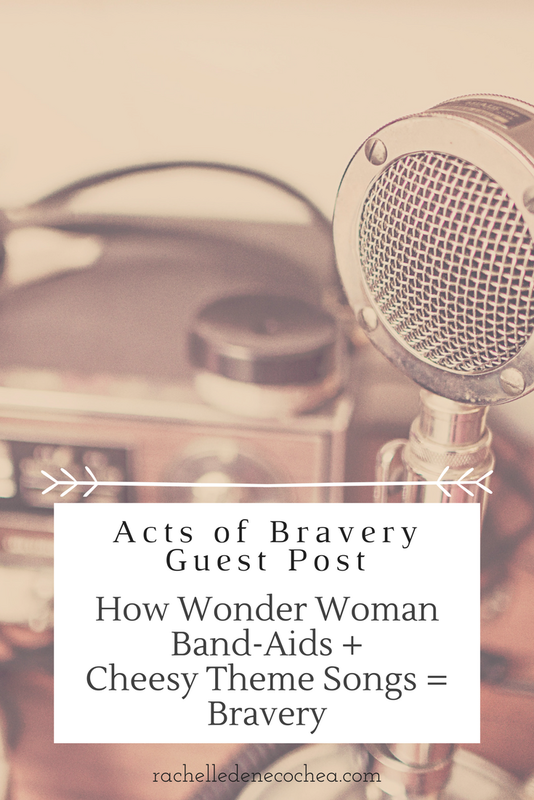 Be your own kind of Wonder Woman band-aid. And if you see me around town, I don’t mind if you say hello, because sometimes it’s hard to always wear my Wonder Woman cuffs and cape and I often take them off to let my shy girl roam. She needs to breathe. It’s all about balance, really. What about you? What would your theme songs be? What is the brave thing that you’d step out to do to cultivate bravery into your life?